Like other specific Dengue ELISA kits, the Dengue IgM ELISA Kits are enzyme-linked immunosorbent assays for the qualitative identification of antibodies to dengue in human serum. Serological testing is a common method of identifying dengue antibodies, and Dengue ELISA Kits have been found to be some of the most useful methods for bringing about exact serological diagnosis of dengue infection. Because of their sensitivity, capability of handling many samples (96 wells), and potential for automation, Dengue IgM ELISA kits have been taking the place of other procedures that detect IgM antibodies. Dengue IgM ELISA Kits are quick, easy-to-use, effective in diagnosing patients, and are reliable. Dengue IgM ELISA kits are highly sensitive assays that detect dengue antibodies. Sensitivity of Dengue IgM ELISA kits is 86% and Specificity is 100%. 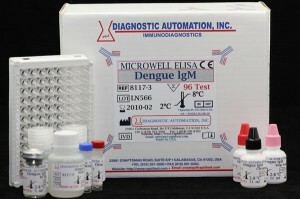 In addition, results of Dengue IgM ELISA Kits can be obtained is less than 30 minutes. The principle of Dengue IgM ELISA kits involves three incubation steps (10 minutes each). Purified dengue virus antigen from Vero cell cultured type 1-4 dengue is coated on the microwells before adding patient’s sera at the first incubation procedure. During the second incubation step, the added enzyme conjugate will bind to any antibodies present. The third incubation involves the addition of TMB chromogen. ELISA kit readers can be used to obtain results, or the results can be read visually. See the Dengue IgM Product Page/Insert for more information. Click here. Other reliable ELISA Kits in the diagnosis of dengue infection are Dengue IgG ELISA Kits, Dengue IgG/IgM ELISA kits, and Dengue NS1 ELISA kits for detection of NS1 antigens in human serum. For more information on any of the Dengue ELISA kits or any other ELISA Kits, Parasitology ELISA kits, Rapid Test, IFA Kit, CLIA Test, or Serology Test, please check our website [ here] or contact our Customer Service Department at 818-591-3030. How prepared are parents and health organizations in regards to infectious disease transmission among children returning to school? The school season is a heightened time for children to be exposed to contagious bacteria. The closer the contact with other children, school equipment and materials, the greater the chance of transmission. An infectious disease can range anywhere from strep throat to seasonal flu; however, in some communities there could be a more serious onset, such as meningitis or typhus. Parents, school officials, and health organizations may want to be on alert for any signs of illness in their community. Open communication between schools, teachers, parents, doctors, and health agencies is vital during this time. Early detection can ward off any possible serious epidemic that would keep children away from school for extended periods of time. If an infection is suspected, immediate testing for appropriate diagnosis and treatment is encouraged. 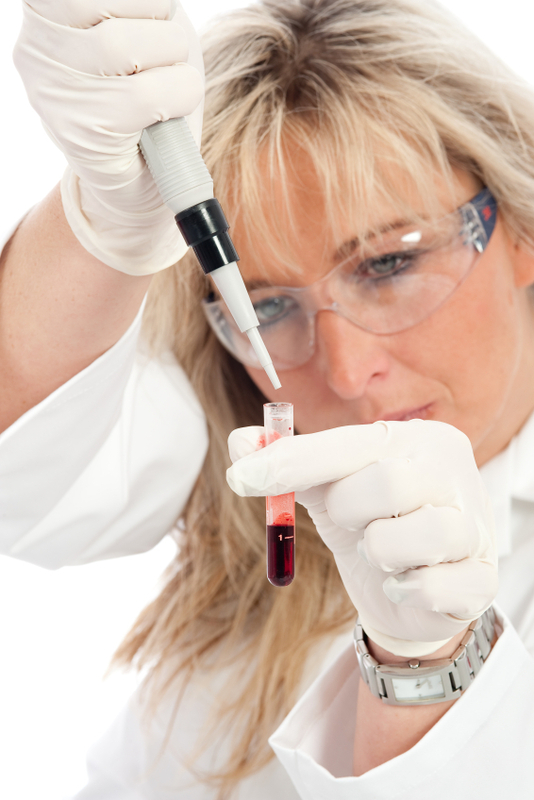 Is your organization ready for a possible increase in requests for medical diagnostic testing? Do you have enough diagnostic testing kits on hand to cover any possible outbreak in your community? Los Angeles-based Diagnostic Automation/Cortez Diagnostics, Inc. is keenly aware of this seasonal time period for infectious diseases. Reliable, efficient, and cost effective products are available to address the variety of infections that affect back-to-school kids. 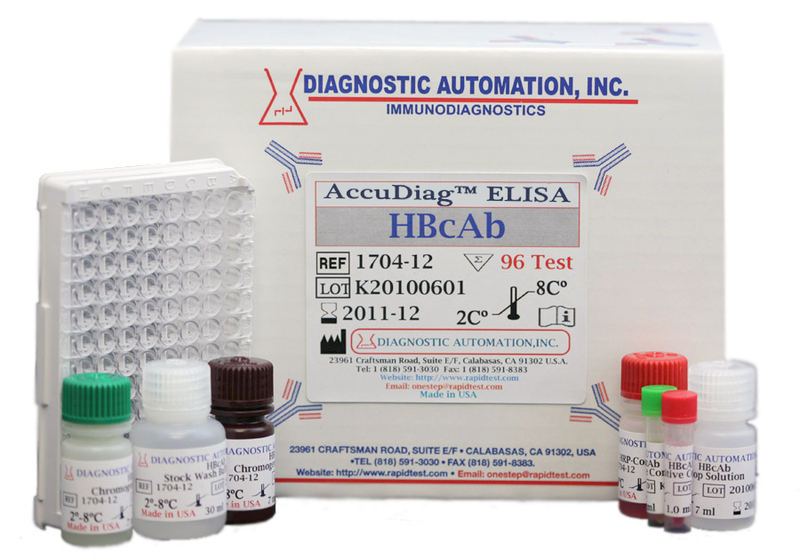 Available are ELISA Test Kits, Rapid Tests, IFA Kits, Serology Tests, and CLIA Test kits. Below is a partial list of infectious disease ELISA Tests (school-related infections). For complete listing of ELISA Tests, click here. Diagnostic Automation/Cortez Diagnostics, Inc. also offers a variety of Infectious Disease Rapid Tests, Serology Tests, IFA Kits and CLIA Test kits. Ask our friendly Customer Service Representatives at 818-591-3030 for more information on these test kits. We carry some of the best quality and inexpensive medical diagnostic testing products worldwide. If you don’t see a medical diagnostic test kit above, please ask about other available products and check our online website. Click here for home page listing of products. What kinds of West Nile Virus tests are there? A West Nile ELISA Test is recommended as the best way to confirm presence of the West Nile virus in human serum. The West Nile ELISA tests are intended for qualitative detection of IgG and IgM antibodies to West Nile virus in blood. What’s the difference between West Nile IgG ELISA test and West Nile IgM ELISA test? Early in the infection period virtually all infected persons show signs of IgG antibodies in blood. The West Nile IgM ELISA Test for IgM antibodies in serum is consistent with acute-phase infection with the West Nile virus. The West Nile IgM ELISA test may be ordered along with IgG ELISA test, and both may be re-ordered 2-4 weeks later for follow-up analysis. How does a West Nile ELISA test work? 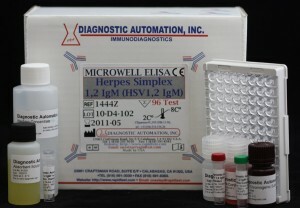 A West Nile Virus ELISA Test consists of one enzymatically amplified two-step sandwich-type immunoassay. The West Nile ELISA test kit employes a recombinant antigen called WNRA which can be used as a rapid serological marker for West Nile infection. A test kit contains sufficient reagents for one plate of 96 wells (12 x 8 strips) each. What are the notable features of these tests? West Nile ELISA tests are safe, accurate, and convenient to use. They have high sensitivity (96%) and specificity (98%) and are cost effective. West Nile ELISA tests contain easy-to-follow instructions, sufficient materials for specimen collection, and user-friendly test preparation procedures. Reliable results will be obtained by using precise laboratory techniques and accurately following the package insert. Can anyone use the West Nile Virus ELISA Test? If an infection is suspected, a physician can request an analysis of blood from a clinical laboratory. The West Nile ELISA tests are intended for qualitative detection of IgG and IgM antibodies, respectively, to each corresponding kit. They are not intended to screen blood or blood components. The West Nile ELISA tests are available for export throughout the world. In the U.S. the tests are approved for research only. Laboratory testing time for the West Nile ELISA test is approximately 3 hours. How can I learn more about your West Nile Virus ELISA tests? Our top quality West Nile Virus ELISA kits are available at competitive prices and are shipped quickly to any place around the world. Customers may also inquire about our other ELISA Tests, or Rapid Tests, Serology Tests, IFA Kits, or medical testing Instrumentation. Please visit our Home page, or contact our Customer Service Representatives at 818-591-3030 for more information about these tests, or the convenient and inexpensive West Nile ELISA test kits. Los Angeles-based Diagnostic Automation/Cortez Diagnostics, Inc., a global leader in the field of manufacturing and distributing medical testing equipment, is pleased to offer a top quality Dengue NS1 Rapid Test kit at an affordable price. This inexpensive Dengue NS1 Rapid Test is known for its superior sensitivity and specificity in accurately detecting early Dengue infections. This Dengue NS1 Rapid Test is a qualitative membrane-based immunoassay for the detection of NS1 antigen in human serum. Notable features of this Dengue NS1 Rapid Test are its safe, convenient, and easy-to-use test procedures and accurate, quick results. Los Angeles based Diagnostic Automation/Cortez Diagnostics, Inc. has been a leader in the development of infectious disease rapid tests for more than 20 years. In the past, some available tools for dengue virus detection have been time-consuming. However, this particular Dengue NS1 Rapid Test now being offered, is proven to be timely, sensitive, and specific when dealing with early detection of the Dengue NS1 virus. The use of tests like the Dengue NS1 Rapid Test as a first-line test for the screening of dengue-infected patients, could help accelerate the diagnosis of dengue fever in clinical diagnostic laboratories. Rapid and easy diagnosis of dengue using Dengue NS1 Rapid Test, can assist patient triage and care management. For example, during an epidemic outbreak, the ability to triage those patients suspected of having dengue fever and to quickly establish an anti-viral therapy with use of a Dengue NS1 Rapid Test, might improve the rates of disease control drastically. Thus, the Dengue NS1 Rapid Test presents the ideal method of testing as it is rapid, easily applicable, sensitive, and highly specific. Available to customers worldwide, the Dengue NS1 Rapid Test Kit is offered in a strip format only. 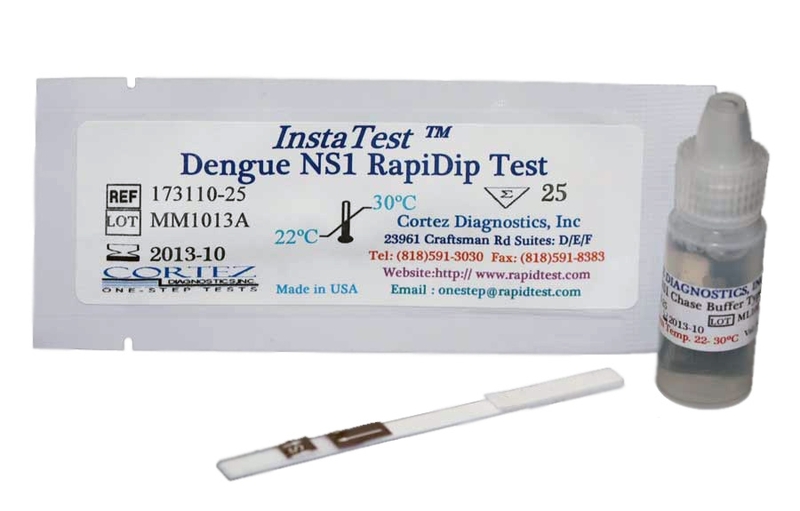 This One-Step Dengue NS1 RapiDip Insta Test (strip format) is a qualitative, membrane based immunoassay for the detection of non-structural protein 1 (NS1) antigen in human serum. The Dengue NS1 Rapid Test membrane is pre-coated with a NS1 specific antibody on the Dengue NS1 Rapid Test line region and utilizes a separate control to assure assay flow and performance. If NS1 antigen is present, a red line will appear on the Dengue NS1 Rapid Test line. The entire procedure using Dengue NS1 Rapid Test-strip is approximately 30 minutes. Each Dengue NS1 Rapid Test Kit contains 25 Dengue NS1 Rapid Test dipsticks, sixty-four (64) individual sample reservoir wells, and one vial of Chase Buffer, Type A. 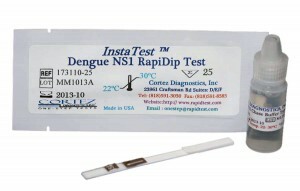 Multiple Dengue NS1 Rapid Test Kits (strip format) can be shipped in packages of 25 or 50. Closely related to the Dengue NS1 Rapid Test Kit is another product in the field of Dengue IgG/IgM Antibody virus detection — the Dengue Rapid Test Kit (cassette format.) Specifically labeled as the One-Step Dengue RapiCard Insta Test, this test is an immunochromatographic assay for the simultaneous detection of IgG and IgM antibodies to Dengue virus in human whole blood, serum, or plasma. This Dengue Rapid Test-cassette is used as a screening test for Dengue viral infection and as an aid for differential diagnosis of primary and secondary infections in conjunction with other criteria. This Dengue Rapid Test-cassette is a new generation immunochromatographic test using recombinant dengue viral antigens of all four serotypes to detect specific antibody response. The Dengue Rapid Test Kit – cassette utilizes the principle of immunochromatography where mouse anti-human IgM and human IgG antibodies are immobilized as two individual test lines. As the Dengue Rapid Test sample flows through the membrane assembly, a colored band appears which confirms a positive test result. Absence of the colored band in the Dengue Rapid Test window indicates a negative test result. A notable feature of this Dengue Rapid Test-cassette is that a built-in control line will always appear in the Dengue Rapid Test window when the test has been performed properly, regardless of the presence or absence of anti-Dengue virus antibodies in the specimen on the Dengue Rapid Test. Each Dengue Rapid Test Kit-cassette contains OneStep Dengue RapiCard Insta Test in a foil pouch, a sample buffer, and the product insert. These Dengue Rapid Test Kits-cassette can be shipped in bulk or boxed in 25 or 50 tests. Besides the Dengue NS1 Rapid Test Kit-strip and the Dengue Rapid Test Kit-cassette, other Dengue Test Kits offered by Diagnostic Automation/Cortez Diagnostics, Inc. include several Dengue ELISA Test Kits. One is a Dengue NS1 ELISA Test, which is a highly sensitive, rapid, and reliable assay that uses a two-step sandwich type immunoassay to detect low levels of NS1 in serum. The other three Dengue ELISA Tests include: Dengue ELISA Test for IgG antibodies, the Dengue ELISA Test for IgM antibodies, and the Dengue ELISA Test for IgG/IgM antibodies in human serum. All above-listed Dengue NS1 Rapid Test, Dengue Rapid Test Kit, Dengue NS1 ELISA Test Kit, and Dengue ELISA Test Kits are readily available for shipment worldwide. Please contact our Customer Service Department for further information on any Dengue NS1 Rapid Test Kit, Dengue Rapid Test, Dengue NS1 ELISA Test Kit, or Dengue ELISA Test Kits. USA-based Diagnostic Automation/Cortez Diagnostics, Inc. manufactures and distributes top quality, accurate, safe, and convenient medical testing equipment. Included in this array of medical testing products are various Rapid Tests (HIV Rapid Test, Infectious Disease Rapid Tests, Hepatitis Rapid Tests, Drug Tests, Cancer Rapid Tests, Pregnancy Rapid Tests, and many more). Many of the ELISA Test Kits offered include: Food Allergy ELISA Test Kits, HIV ELISA Tests, Hepatitis ELISA Tests, Parasitology ELISA tests, Blood bank ELISA Tests, and several other ELISA Test Kits). 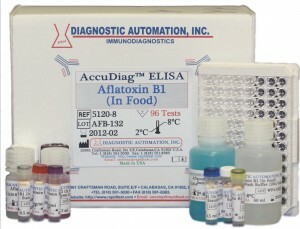 Additional products include: IFA Kits, CIA Test Kits, and Serology Test Kits. Please contact our Customer Service Department for more information on any of these Rapid Tests, ELISA Test Kits, IFA Tests, CIA Test Kits, or Serology Test Kits.